Welcome back, our legend-loving readers and fan-fiction fanatics, to the Hero of Time Project, where we, the Know-It-All Brothers, are excited to share with you the first chapter of our Hero of Time story. 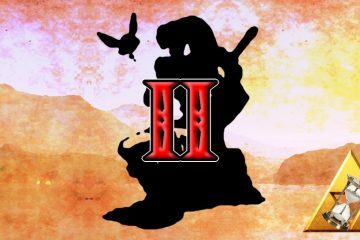 This opening is hotter than King Dodongo’s fire-breath (and only half as smelly), so buckle up, and let’s get this show on the road. 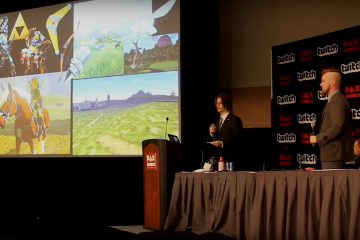 We also had the opportunity to speak on the subject of analytical fan fiction at PAX East 2018, which was an incredible opportunity! In the coming works by yours plurally truly, we’ll begin telling the story we’ve been talking about since October of 2017. These articles will be formatted as narratives written by CJ Thomas, essentially chapterizing the story we’ve been working up to telling. At the end of these articles, there will be a critical storytelling analysis written by Jaron R. M. Johnson, examining this work in the same way that we at With a Terrible Fate would examine any real video game. 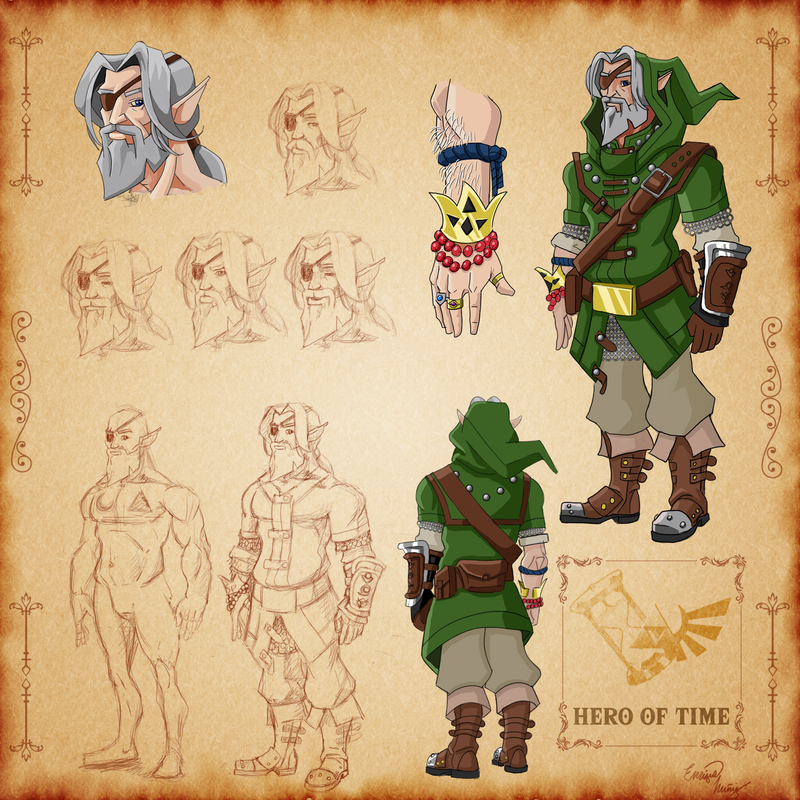 The Hero of Time story, when it was originally conceived, was intended to be the storyline of a video game. The narrative reflects that intention, and often references the player directly. There are points at which we will try to give an idea of what the video game might feel like, discussing things like combat mechanics or questlines and weapon design, but we’ve tried our best to adapt this into a completely readable format. Without further ado, please enjoy our first chapter of Hero of Time. However, the youngest member of the tribe, Link, has not woken up. He lies on his bed, tossing and turning in a particularly terrible dream. When young Link finally rolls over, groaning himself awake, he is so groggy from oversleeping that he simply sits up on his bed in a stupor for a few moments. Looking around, Link realizes that he’s no longer trapped in his nightmares—he’s in his treehouse, nestled quietly within Kokiri Forest. Link stands up and the player is granted control and the ability to run around. But wait… Isn’t this normally where Navi shows up? Kokiri Forest, quiet and serene. It’s all coming back now. The player remembers that in order to proceed, they need to acquire the Kokiri Sword. Most players will remember precisely where to find it, while new players will have to perform the same song-and-dance routine that old-hat players did in Ocarina, searching for an answer from the populace. The player takes Link to the edge of the village, crawling through the familiar tunnel into the hidden grove where the Kokiri Sword is kept. A much older man awakes suddenly, his shock and aching back tearing him away from sleep. His weathered and wrinkled face is obscured by darkness. That day in the Kokiri Forest was nearly 70 years ago. His wrinkled eyes peel open. He’s underground, propped against a cold stone wall, surrounded by rubble and dust. 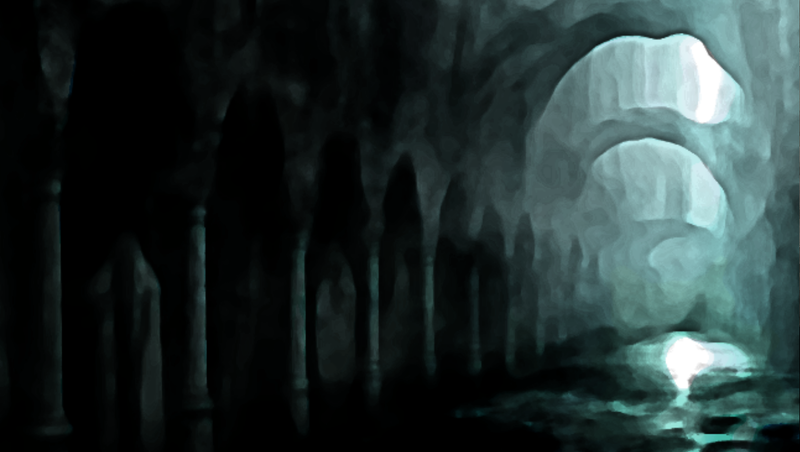 All around, the echoes of wide caverns and dripping water can be heard. Link, the Hero of Time, stands up slowly, his soft grunts echoing into the darkness. His eyes already adjusted to the dark, Link looks around and reorients himself. He’s inside a massive and ancient underground highway. To his knowledge, it connects nearly all the kingdoms of the known world in a spiderweb of dark, gloomy tunnels. This tunnel, however, goes to a place Link has not visited in a very long time. A moment later, Link, once again under control of the player, begins to run in a full sprint into the opposite direction of the earth-shaking roar. The walls and the great pillars above them are delicately carved with intricate designs. Large abstract designs, and the occasional Triforce, are prominent features. As Link continues down the tunnel, he eventually comes to a place where the highway has degraded: the massive bridges are crumbling, and in some places, completely fallen to pieces. There are large gaps between sections that stand at towering heights within this large chamber, like the ceilings of a cathedral. The player is forced to jump to each of the remaining sections of the pathway, which eventually take him upward onto an upper walkway. It is here, as Link begins to traverse a more complete path, that the beast that has been chasing him suddenly explodes through one of the sidelong walls. A massive creature resembling a demonic lion bursts through a weakened section of wall. It sails towards Link, but it is forced to dig its claws into the edge of the upper walkway, ripping up large sections of stone as it nearly plummets into the pit below. Link uses this opportunity to dash away, continuing to run along the walkway before the beast can regain its footing. When it finally does, it chases Link down the long, dark tunnels of the great underground highway, knocking large pieces of the banister off as it hurdles over the ancient stone. Further down the hall, the ceiling opens just a little, with large cracks forming that lead to the surface. Some of the cracks have deposited dirt into the tunnel; others have massive vines growing through them. Link realizes that the section of walkway he’s approaching has all but crumbled, leaving him nowhere to run. As the beast approaches, Link swings on these vines to the other side of the hall, landing on the other walkway. The beast is forced to stop and jump across the gap, giving Link time to get away. The player repeats this process in equally dangerous circumstances until finally they can see the exit. They then leap down from the catwalk into the tunnel’s ground floor, and the light of day is just ahead. Through the massive doorway, Link can see the green grasses of Hyrule Field. Unfortunately, he can hear the beast gaining on him. The beast rounds a corner behind him, and before he realizes, it’s nearly on his heels. He sprints as fast as he can towards the door, knocking a rock in front of the demonic lion, staggering it. Finally, Link makes it outside, but before he can continue, he must deal with the beast. Link quickly notices a nearby lever, and runs to it, throwing it just as the beast lunges towards the massive doorway. At the last second, a door drops down in front of the creature. On Link’s side, the massive stone door cracks as the beast runs into it, headfirst. For a moment, Link can hear groaning on the other side of the door; he turns and smiles before stumbling backwards towards the door. Link collapses against the stone, wheezing heavily. In the full light of day, Link can finally be seen and scrutinized. He is very old, and wears a long grey-white beard with his shaggy white hair. His right eye is missing, and covered by a leather eyepatch. While Link’s outfit is still green, the roughly sewn tunic he wears now is a far cry from his original boyhood outfit. His tunic has many patches, a hood, and only one bracer remains on one of his arms; the other arm is covered in bracelets and rings. Link is also noticeably not carrying the Master Sword, having left it in the Temple of Time some 70 years ago. Our Hero of Time, Link. Navi teases Link for being so exhausted, bobbing up and down in his face. Link smiles and swats at Navi. He laughs with what little breath he has, his voice deep and gravelly from age. After another moment, Link gets up and looks around. Hyrule Field is bright and beautiful. It stretches on in a sea of green, for what seems like forever. Progress Map of the region. The Triforce indicates Link’s location. Link begins at Highway Tunnel. Link has only been back a few times since his journey during Ocarina, but seeing the fields, the river, and Death Mountain in the distance instantly brings his memories flooding back. He and Navi take a moment to look around, running to the nearest hill for a better look. At the top, the view extends to include Castle Town, nestled in the distant river lands, and another hill towards the center of the field which holds Lon Lon Town. Despite Lon Lon Town being one of the new centers of trade in the region, Link had never quite got around to visiting that bustling ranch-turned-market from his childhood. From here, Link can see the smoke rising from the town’s various chimneys. Although that smoke seems… darker than it should. Link nods in agreement, and the two of them set off. 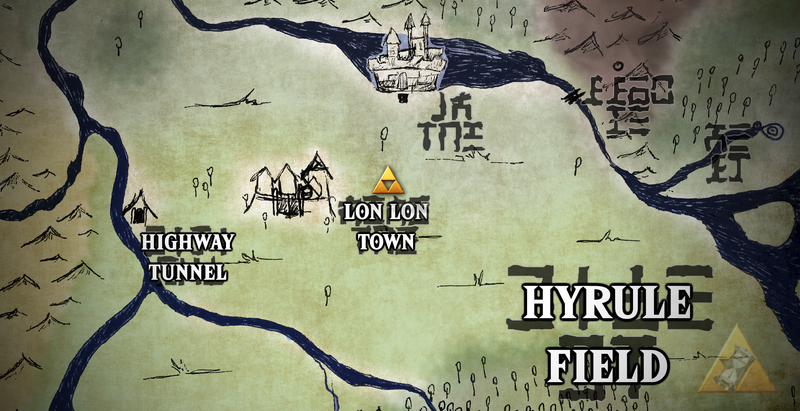 Lon Lon Town is a ways away, but Link is no stranger to walking. 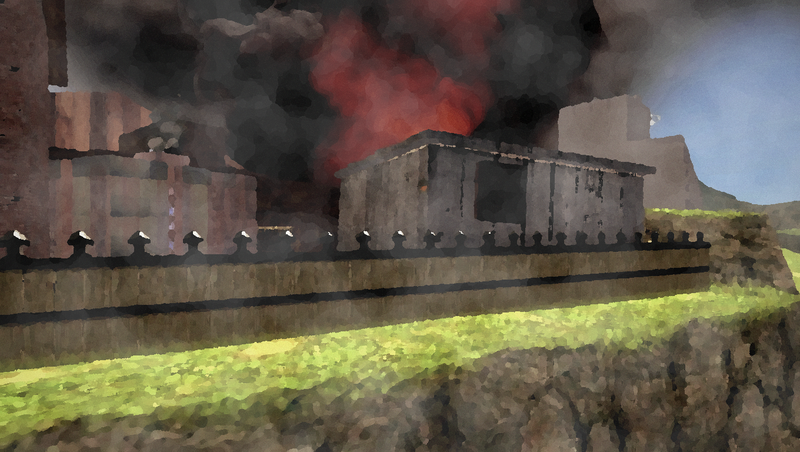 When Link gets within about 200 meters of the town, he can clearly see the smoke rising from places it shouldn’t. He also hears a scream. Lon Lon Town, at the center of the vast Hyrule Field. “Link, get down!” Navi says. Link drops behind a rock, peering out at the gates of Lon Lon Town. A group of several Bokoblins appear at the gates, sealing them behind and standing guard outside. Lon Lon Town is clearly in some serious trouble. Link stands up and moves to engage the Bokoblins, giving the player their first real look at combat. “Go away! This town now ours!” shout the Bokoblins from inside. The gate is locked, and Link cannot proceed. Link and Navi circle around the town’s large stone wall until they locate a aqueduct grate. Link opens it, and the two of them crawl in. Link makes his way up through the complicated sewers and tunnels under the town. Like the rest of the town, the sewers appear fairly new, or at least not ancient; but much of the underground appears to bear signs of an ongoing construction effort. In several cases he must open grate doors using the construction equipment. Very quickly, Link finds a large hammer amongst the supplies. He picks it up, and after a moment, he decides to take it, and begins smashing through several walls he couldn’t get through before. After several more chambers, Link enters the place where the sewers connect to Lon Lon’s recently built jail—there, he finds the people of Lon Lon Town trapped inside several holding cells and being guarded by a pair of Bokoblins, who are quickly dispatched as Link throws his round shield into them, knocking them into the bars. He works to rescue the townspeople by undoing the complicated trap the Bokos left behind. As Link eventually makes his way up and out of the underground, he moves his way into houses and onto the walls of the city. From here, he can see that large portions of the city have been blocked off by collapsed structures. The Bokoblins have also begun to set up improvised blockades and are raiding several of the buildings—including the town hall. Lon Lon Town, partially destroyed by the Bokoblin siege. After clearing out several houses, smashing the blockades with his newly-acquired hammer, and making his way to the town square, Link looks around and notes that several of the houses have massive holes smashed out of their sides. Link and Navi enter the square in front of the Town Hall—a large building with decorative columns, and a medium-sized clock installed over the door. The square is empty and silent—and the double doors into the hall itself are kicked in. Entering the Town Hall, Link finds a massive Bokoblin wielding a large club. Both Link and Navi look up, visibly impressed. Link and Navi stand before Begotra, The Terrible, Mighty Chief of Bokoblins. Begotra stands tall, and his stomach sticks out of his piecemeal armor plates. He growls and swings his club in a circle, wrecking the decorations in the hall. A boss battle ensues. Link dodges Begotra’s massive club and uses his comparative speed to whittle the giant down—occasionally smashing his exposed stomach and knees with the hammer that Link acquired earlier. After a lengthy battle, Link takes a mighty swing at the beast, and several pieces of Begotra’s armor explode off of him as the hammer lands. Link draws his sword as Begotra falls to his knees, he attacks Begotra—and he shatters his rusty old sword off of Begotra’s back, dropping the beast onto the floor. “Nooo!!! !” Shouts Begotra as Link beats him within an inch of his life. It’s at this point that Link backs away, holding only the handle of his sword. The blade of Link’s sword has shattered, with a large piece sticking out of Begotra’s shoulder. Begotra cries, and is clearly beaten. He stands up, stumbling at first, and begins to flee through the doorway. Link watches as Begotra and his Bokoblins quickly exit the city. Link continues to watch, making sure that they are truly gone. Lon Lon Town sings Link’s praises, and Link acquires a piece of Begotra’s armor: a large, singular shoulder pad. 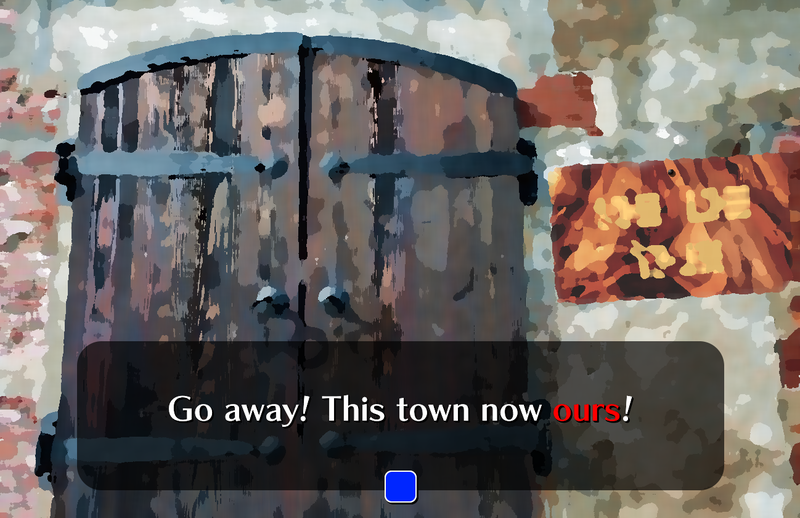 Now that the struggle is over, Link exits the town hall and the player is given the freedom to wander the town. Aside from the damage to the village, Lon Lon Town has many quaint, traditional buildings accented by merchant stalls that line the main street, which leads from the Town Hall to the gate of the city. The street already looks different, with many of the villagers working to remove the barricades. While some workers immediately begin repairs, other villagers still find themselves in shock, standing next to their homes, or in the street. Navi begins to ask these villagers questions; where did these Bokoblins come from? Why attack Lon Lon Town? The villagers are unable to answer these questions, and many of them simply complain. There are no answers for the villagers many questions and complaints. Link could stop the attack, but his ability to solve the administrative issue that follows is limited. Link instead uses the time to explore the town and meet the people. There’s a baker whose shop has burned down; he sits outside on a chair, holding a loaf of burnt bread, and says nothing. Nearby, a mother and her teenage son open their shop up to the public; the mother bitterly complains about her lazy husband. At the edge of town are the original pastures that Link remembers from his childhood when the town was still just Lon Lon Ranch. A young couple sits on the fence at the edge of town, watching the cows graze. A series of graves sit behind the town hall, in between the busy streets and fields of cattle. The player can visit this graveyard and look at each of the graves: one of them belongs to Talon; another belongs to Malon, inscribed with “loving mother and wife.” A third grave belong to man named Torvald, who is cited as husband to Malon. After the siege is thwarted and Begotra is driven off, the townsfolk of Lon Lon Town make an attempt to return to their simple way of life and begin repairs on the town. After a short while, Link makes use of the shops that are still operable, allowing him to purchase some very basic equipment, and even some arrows for his bow. However, there is no weapon shop currently available, and Link will have to make purchases in Castle Town. Navi promises the town elder, a middle-aged man named Falon, that the two of them are taking the matter of the attack to the royal family. With that, Link and Navi depart, setting off for Castle Town in search of answers. Link travels north, to Castle Town. First, let me begin by saying we hope that reading the above got you excited to read more of the narrative! How does this chapter enrich our understanding of the Zelda series as a whole? How does this chapter bridge the gap between Ocarina of Time and Twilight Princess? How does this chapter show Link’s maturation and the maturation of the series and its fanbase? How does this chapter combine “old” and “new”? From Hero of Time: What makes a Zelda game a Zelda game? How does this chapter enrich our understanding of the Zelda series? Chapter One of the narrative operates as our introduction into the story of Hero of Time. 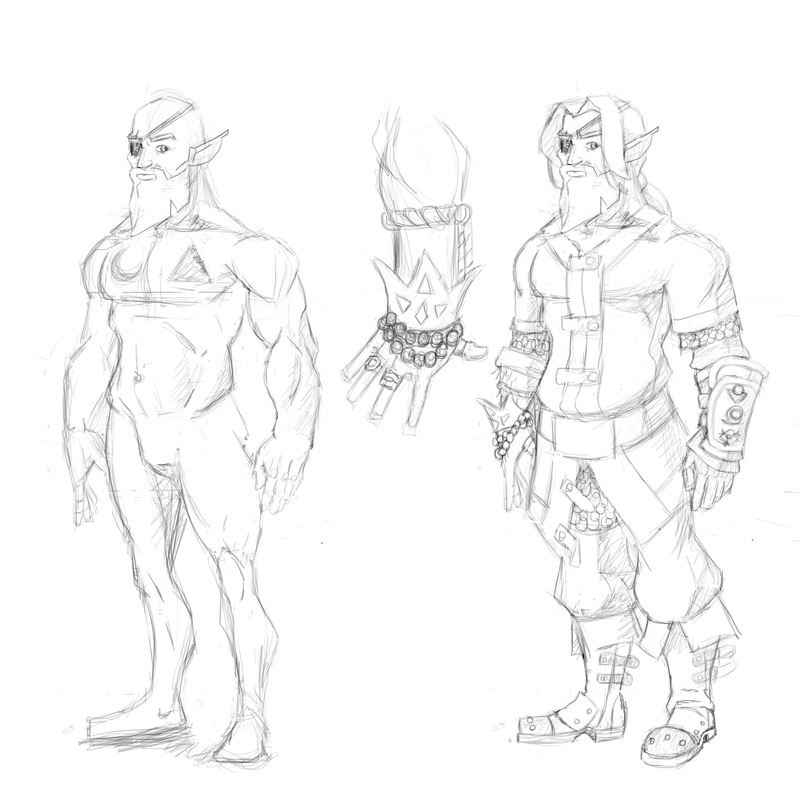 It introduces our vision of the protagonist, some of our visions of the world of Hyrule, and some of the artistic and stylistic choices we plan to make. We specifically focused a lot of effort on writing the opening of the story with the goal of preparing the player for exactly what they should expect. The opening lines of any story, whether it’s a video game, novel, film, or even an online article, are always a make-or-break point. The first few minutes of any story determine whether or not your audience will stick around to hear you out, or if they lose interest and abandon ship. Our story opens with a flashback sequence, which begins to set the tone of Hero of Time. It takes old players back to a familiar setting, and takes new players back to a historically relevant setting: Link’s childhood. However, we add a sensation of “old and new” to the mix by changing the way this particular section of the story plays out. This adds a fresh perspective to a familiar setting, and gives players a chance to re-examine one of the key locations in a game that’s often heralded as the best game in the Zelda series: Ocarina of Time. By giving players a fresh perspective on something they may not have seen in years, it builds their level of familiarity with not only the original story, but also with the identity of Link, Hero of Time. Players get to re-experience not only a defining moment from their own childhood, but, now that we’re all a little older, players also get to re-experience a defining moment of Link’s life: his call to adventure. The advent of his journey. The moment that set his life in motion, barreling towards courage and altruism. 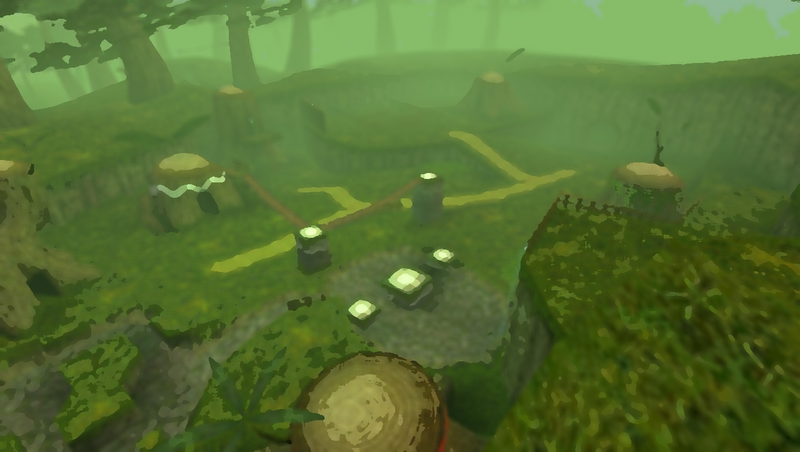 Once players complete this section, they are placed in control of Hero of Time’s true avatar, Old Man Link. 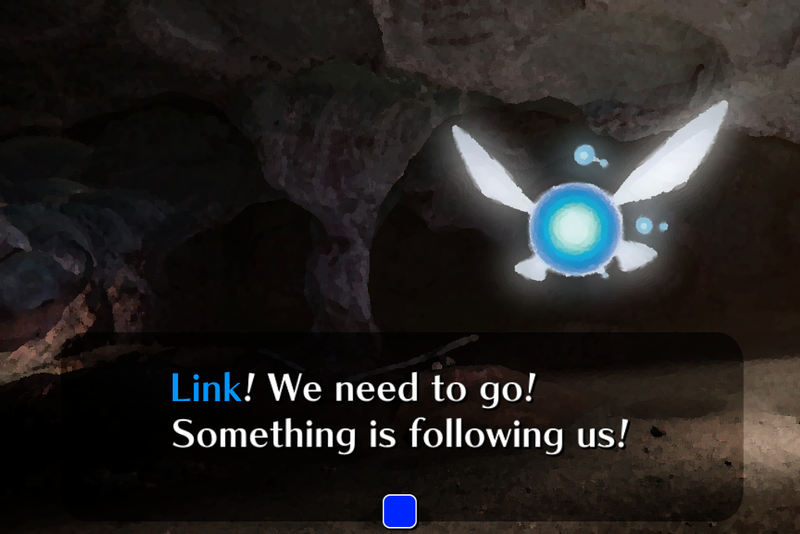 They’re then introduced to a new location, which they later understand to be an underground highway that seems to be the method Link uses to travel from world to world. When the player sees a redefined Link and an unfamiliar location, they’re thrusted into the “here and now” of Hero of Time. Taken out of the “old” and into the “new,” players begin to realize that this may not be a typical Zelda story. 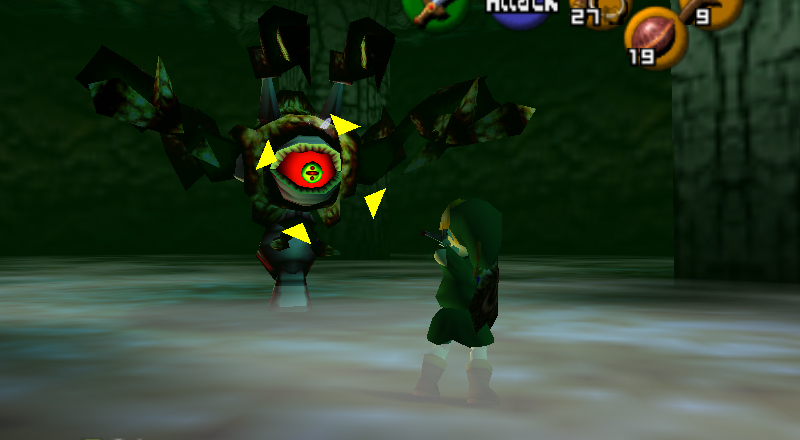 When Link exits the tunnel, the player is treated first to a clear depiction of “Old Man Link,” which does a lot to start their minds churning. He is no longer the charming young boy they’ve come to know over the years: he’s weathered by time; the mysterious element that he used to manipulate is now in control of him. His outfit is clearly recognizable, but die-hard fans of the series may recognize some repeated iconography and easter eggs in his character design. Concept art of Link in his full adventuring attire. 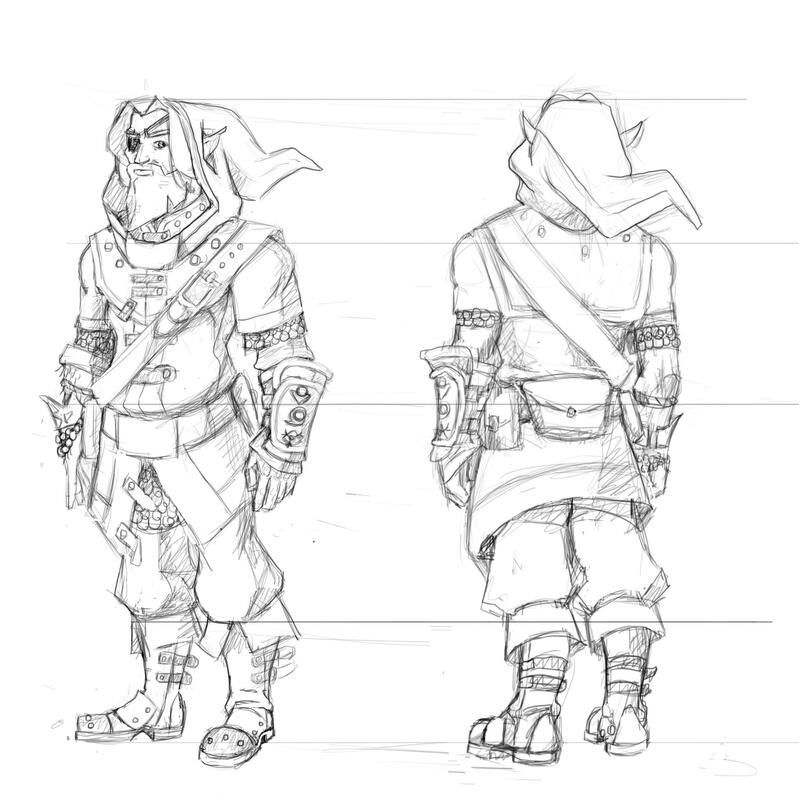 Concept art of Link’s anatomy (or lack thereof) and his tunic under the hooded coif. The chronology of the games continues: time moves ever forward. The Hero of Time is present, albeit not by name, in Twilight Princess. This chapter enriches our understanding primarily of Link, both as a character and with regard to his place in the series at large. We realize that, despite being a mostly-blank slate for players to project themselves onto, Link does, in fact, have an identity within the series. This chapter further enriches our understanding of the Zelda series by illustrating the vision of an in-between Hyrule, between Ocarina and Twilight Princess. The story opens with a flashback sequence that sends players hurtling back to the roots of this story, Ocarina of Time. The sequence immediately illustrates the connection between Ocarina, Hero of Time, and the rest of the Zelda timeline. For players who have played Ocarina of Time before, there is an immediate sense of dissonance with what they’ve done before: Navi is gone. Players who are unfamiliar with the setting of Kokiri Forest will still get the sense that something is eery and awry, which is important for the rest of the story. A map of Hyrule in Hero of Time. See full-sized version here. In this chapter, we also get to see how Lon Lon Ranch (in Ocarina) has become Lon Lon Town: a small, but somewhat bustling town, which operates as the center of the trade routes between the far-reaching locations of Hyrule. Players of the previous games will also remember characters like Malon (who are mentioned offhandedly in the narrative itself) from Ocarina. While we purposefully leave some of these characters’ fates vague (though discoverable from investigation with certain side characters, because who doesn’t love sidequests and easter eggs? ), we wanted to hint at them because we feel there’s value in wondering how these characters wound up between Ocarina and Twilight Princess. As fans who have played Hero of Time’s implied prequel as well as its implied sequel will note, the Lon Lon Ranch of Ocarina of Time disappears somewhere between that story and the story of Twilight Princess, with little to no explanation. For fans who love delving deep into the lore, seeing this small town and knowing its fate in Twilight Princess foreshadows something very bad happening. It’s important to remember that our driving force for writing this story is to connect Ocarina to Twilight as directly as possible, leaving as few gaps as we can. This allows readers to be able to look in both directions from Hero of Time and make inferences about the story of Hero of Time (and how that story fits into and affects the Zelda timeline) as we progress the narrative. We also encourage readers to leave comments and ask any questions they may have! How does this chapter show Link’s maturation and the maturation of the series? As we discussed in one of our previous articles, we see value in a story respecting its fanbase while simultaneously generating new fans. Link and the Zelda series as a whole are some of the longest-running intellectual properties in gaming today, having been around since 1986. In our story, we’ve obviously literally aged Link to be much more mature. The idea in doing that is to draw a connection between long-time fans of the series (who sometimes feel old when thinking of their favorite, or first, Zelda games) and the avatar they play as. Reinforcing this player-avatar relationship is a crucial way to make the player feel as if they belong in the shoes of their avatar and in the world and story of the game. Many fans report that the first Zelda game they played was their favorite, and this is often due to their connection to Link as a character. As each new Zelda game returns to a childhood or teenage Link, they begin to isolate the fans who loved the series since the beginning. We’ve also matured the Zelda series at large by giving our story a very stark opening: Lon Lon Town under siege, destroyed. People’s lives are heavily impacted by this, so from the very moment that Link and the player return to Hyrule, things are looking bleak, with nary an answer in sight. This also echoes back to the rude awakening Link experiences at the outset of Ocarina of Time by having a prophetic nightmare about Ganondorf’s rise to power. How does this chapter mix old with new? We treat this as the keystone of our story, and lean on it heavily every chance we get so as to achieve our primary goal: creating a powerful Zelda story that caters to old and new fans alike. Our very first interaction with old and new is the direct opening of the story taking place in Kokiri Forest, where Link’s story began. 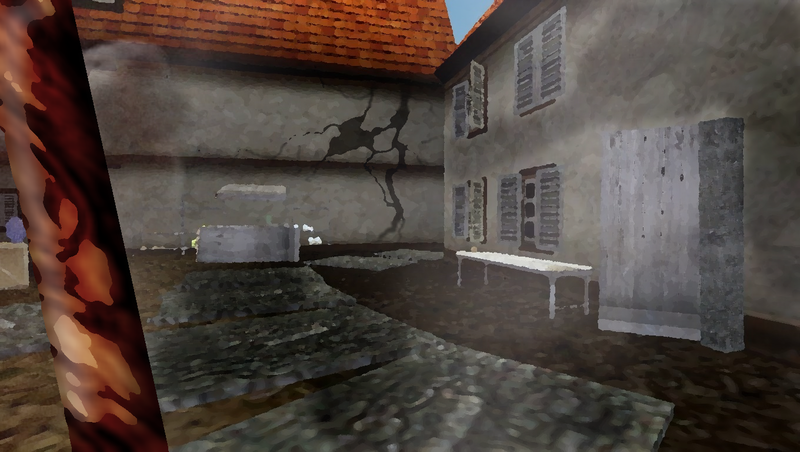 This location is an old one, exactly mirroring itself from Ocarina of Time. 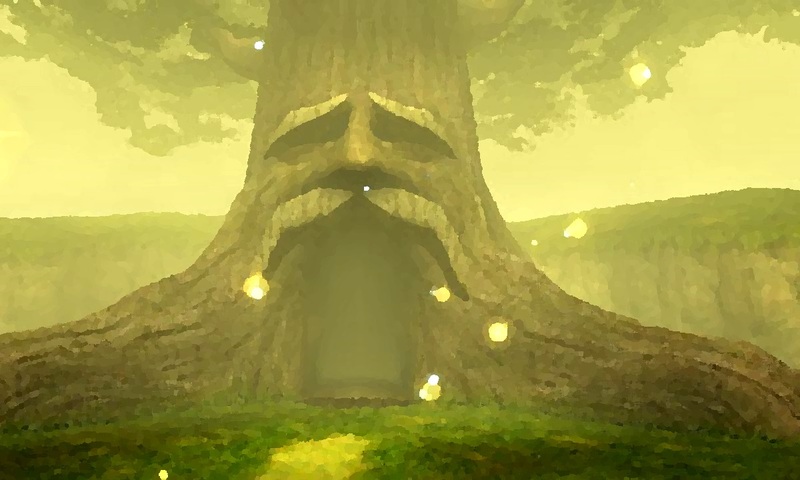 The Great Deku Tree from Ocarina of Time. The twist we’re applying here is that, as players navigate the area and begin repeating their actions, they notice that something feels… off. Mysteriously so. And in the end, when they locate the chest which would normally contain the Kokiri Sword, they find that chest to be empty. 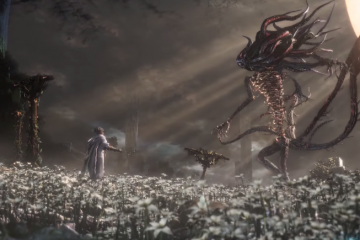 This scene echoes the sentiments painted by many video games (such as the twist-ending in Dead Space or the surrealist existentialism of Silent Hill), giving players the sensation that not everything is as they expect it to be, and that they can’t lean solely on their previous experiences to make it through this story. When Link arrives at the town gates, he is greeted by Bokoblins—one of the staple enemies of the Zelda franchise, and an enemy that the player is likely to recognize. This also gives the player their first taste of combat, where they learn that Link has become almost tactical in the way he handles swordplay. Combat in Hero of Time would play similarly to Twilight Princess (which will make sense to those of you who know the origin of the Hero’s Shade character), with counter-attacks and shield-bashing being mainstays throughout the game. Link’s weapon and shield also have the potential to break or become stronger throughout the game, though we’ll touch more on that in the next chapter. In short, this is our way of combining the old combat of Twilight Princess and the new combat elements from Breath of the Wild. Upon defeating the Bokoblins, Link finds an alternate entrance through a sluiceway (which echoes familiar to the way Link enters Hyrule Castle in Ocarina), and also discovers his first tool of the game: a hammer. The Megaton Hammer, from Ocarina of Time. This hammer was used by an ancestor of Darunia to slay Volvagia. We wanted to echo the usefulness of this item, but without necessitating a convoluted implied backstory. 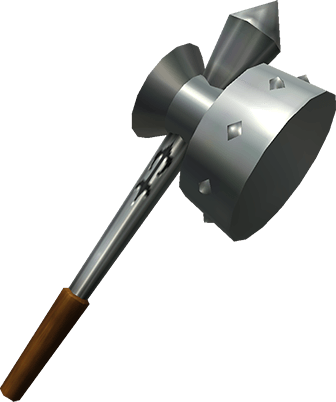 The hammer in Hero of Time is for smashing things. That’s it. Tools and items are a mainstay throughout the Zelda franchise, and we definitely didn’t want to shy away from that. We did, however, want to evolve that mechanic. We gave Link a hammer as his first tool because of its simplicity, and because of the simple nature of his early actions in the story: save the good guys from the bad guys. This hammer isn’t a special heirloom or legendary arcane weapon. It’s just a hammer, used for smashing things. We also wanted to keep one of the other mainstays of the series: the boss fights. This is one element of Zelda games where we thought it best not to change much. Formulaic boss battles are a cornerstone of the Zelda series. Finding the enemy’s critical point and throwing everything you’ve got at it is just a part of what Zelda is now. With that said, it becomes very clear how we approached creating and implementing Begotra. We wanted Begotra to feel like a very natural “first boss” character. 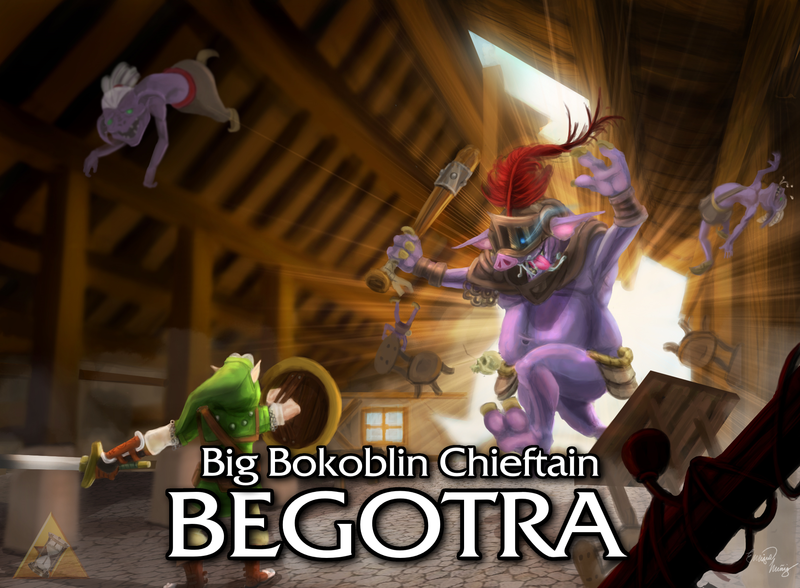 Begotra is really just a Bokoblin Chieftain; there isn’t much special about him. He’s simple, similarly to Link’s trusty new hammer. Therein lies the connection, and in that battle, the pattern of relationships between items and bosses begins to reveal itself to the player. 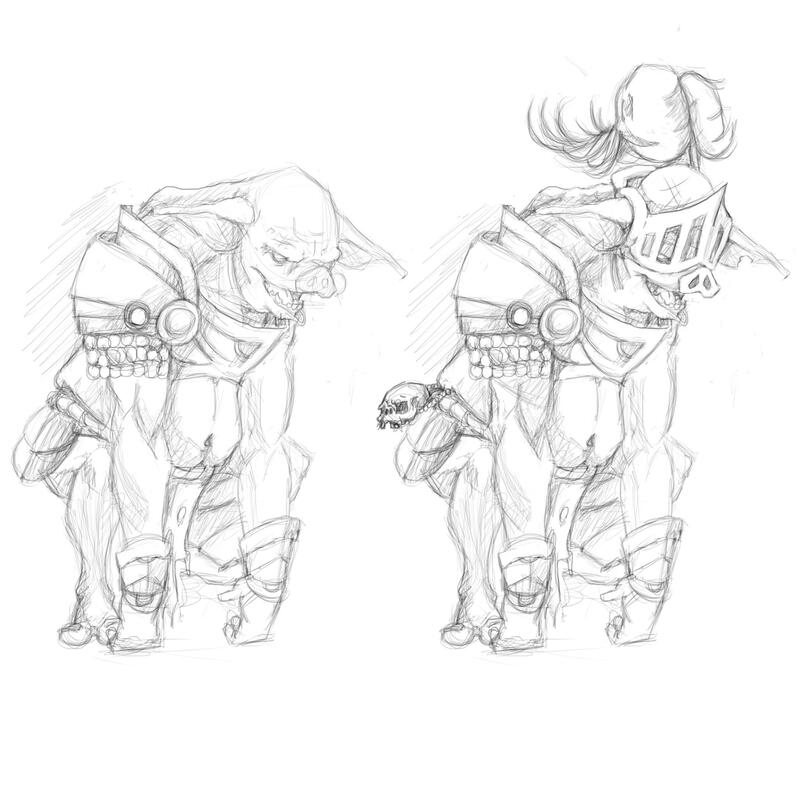 Concept art of the first boss of Hero of Time: Begotra, Bokoblin Chief. Begotra is a lot more bark than he is bite. Link dispatches him quickly by combining attack-and-dodge tactics with smashing-things-up tactics thanks to his trusty new hammer, destroying Begotra’s protective armor and defeating him. Begotra is revealed to be a bit of a coward, adding some comical levity to the dark situation that is a town besieged by evil. And to top it all off, Link acquires a new piece of armor after defeating him. Finally, one of the subtle ways we’re combining old and new is in the artwork we’re producing for the series. We’ve brought on a talented illustrator, Rick Muniz, to help us out with concept artwork similar to the original artwork for Ocarina and Twilight. We’re also creating a lot of our own imagery, from the boss title screens, which use a combination of Rick’s artwork and our own design work (featuring the same typography from Ocarina), to the overworld map we’ve created ourselves. 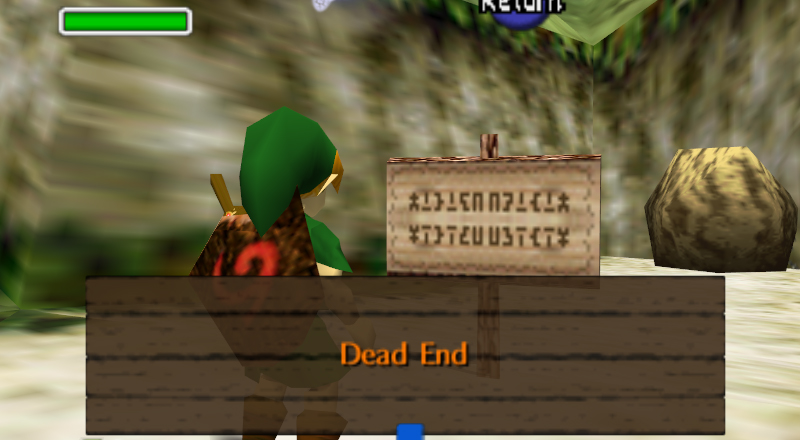 The overworld map utilizes Second Hylian Script, which is the same language used in Ocarina and Majora’s Mask. An example of Second Hylian, as seen in Ocarina of Time. The text on this sign actually reads “Ni-n-te-n-do-u,” or “Nintendo,” mirrored across all four axes. Second Hylian is a syllabary that operates as a cipher of Japanese Kana, and so the text on the map itself is a beautiful combination of Japanese, Hylian, and English all rolled into one (a great metaphor for the series and fans themselves). 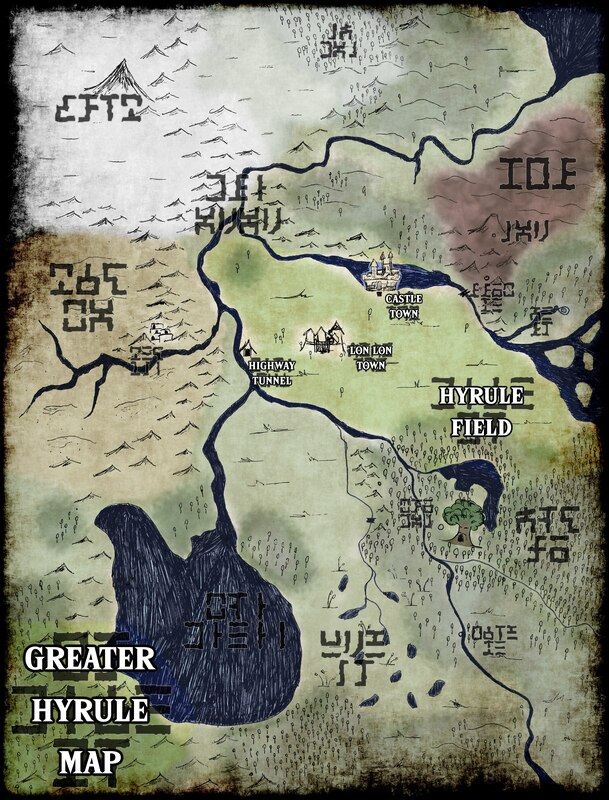 The text on the map is all entirely translatable for those who are interested, but we’ll be actively translating it as we progress through the story as well. This opening chapter offers players everything they should expect to see from the game: throwbacks to previous titles, a sense of dissonance and unity between “old” and “new,” action, tactical sword-based combat, and boss monsters. They’ve seen just enough of this version of Hyrule to entice them to explore, and to want to know more. Readers, we hope that’s you, and we hope you’re as excited to read the second chapter of Hero of Time as we are to tell it. Alright, cool! 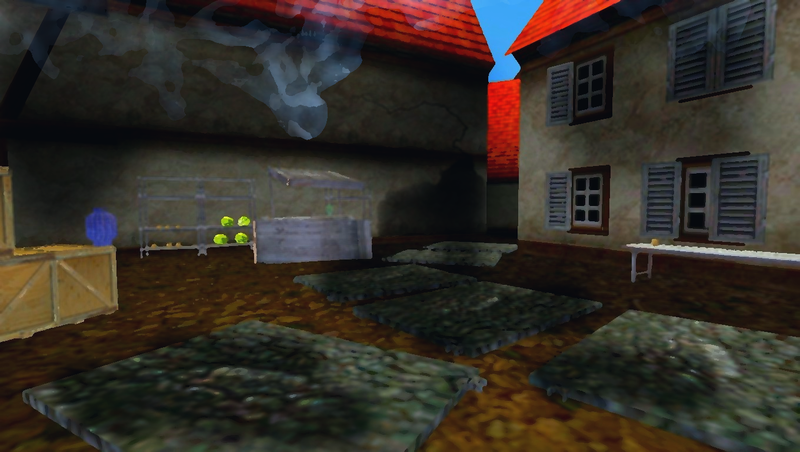 I’ve considered, for many years, using the Ocarina engine to make a game set somewhere within the Hero of Time world. It’s been a treat reading through your analytic approach, balancing themes and quote-unquote canon to come up with something new. I’m looking forward to the next chapter. I’m hoping it’s not going to be several months… because I’m, y’know… impatient.